The Launch Pad: Rockets go with everything -- Especially the Moon! Rockets go with everything -- Especially the Moon! In case you missed it, we announced a brand new team yesterday: the Rocket City Space Pioneers. You can read more about them here and here, and even follow them on Twitter (the team live-tweeted the official announcement of their team yesterday, including comments from the Governor of Alabama). 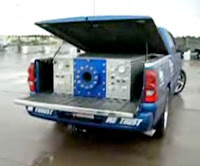 I saw this truck for the first time at the X PRIZE Cup in 2006, and remember thinking, "Whoa, awesome," followed by "Holy crap, someone actually put a rocket engine on their truck?" As Tim Pickens states in one video, "We're from Alabama, you would expect a truck!" Nitrous oxide + asphalt = 2750 lbs of thrust right there, folks. Oh and by the way, in case you were wondering, the bumper reads, "In thrust we trust". For the record, that's Tim on a bike that can go 60mph. Also worth mentioning: Tim's daughter, Sarah, had cold gas propulsion on her pink bicycle at the age of 12, earning attention on The Daily Show with Jon Stewart and in Popular Mechanics, among others. 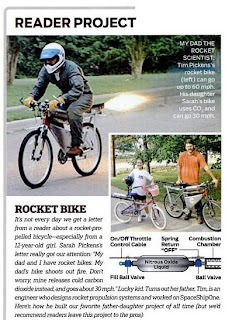 Awesome rocket side-projects aside, Tim Pickens was also the lead propulsion designer for SpaceShipOne and the founder/CEO of Orion Propulsion. Expect some interesting things from this the Rocket City Space Pioneers -- they seem to be a solid team founded on a passion for rocketry, commercial space, and innovation. We look forward to hearing more from them as they develop their private moon mission!